As MI6 first reported back in August, the Bond 24 production team were casting a 'classic, iconic henchman' to go up against 007 in the next adventure. 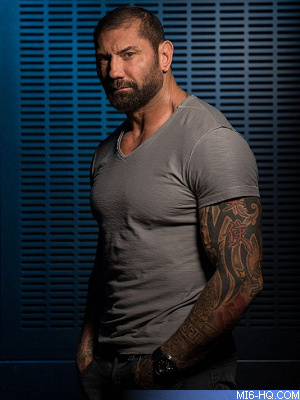 According the Latino Review, 'Guardians of the Galaxy' star and former WWE wrestler Dave Bautista has landed the role of 'Hinx'. 'Guardians' was one of the summer's biggest box-office movies and marked Bautista's debut in film as he played one of the leading superheroes. The 45 year-old American wrestler-turned-actor would not be the first former sports star who landed a Bond movie role. The original casting notice described the role as: "Ideally over 6' 2". Hinx is the main henchman/assassin. We are looking for an imposing extremely physically fit actor. He has several fights with Bond and will have to have stunt training. He has to drive. We are looking for someone very unusual, possibly from a sports background." It has been a busy few days for Bond 24 news, with one of the leading female roles cast, a new film editor confirmed, and more photos emerging from the set build in Austria. Principal photography on Bond 24 starts on December 6th.